Show your support for libraries throughout New York State by proudly displaying a "Love Your Library" license plate. The "Love Your Library" plate is available to anyone with a passenger or commercial vehicle registered in New York State. 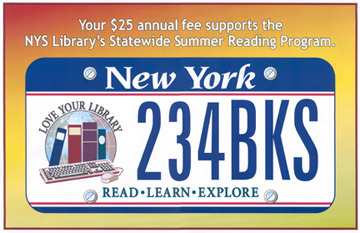 The annual renewal fee for the license plate goes to support Summer Reading at New York Libraries.